Not much is known about The Bank of Malaya Limited. The only reliable information available is from the Straits Times archive. The Bank was established in February 1920. It operated as a single branch bank in Ipoh. 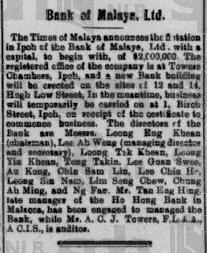 Refer to Straits Times dated 21 Feb 1920 below on the opening of The Bank of Malaya Limited..
On April 26 1932 the Bank of Malaya Limited shut its door due to the depression and was subsequently liquidated. 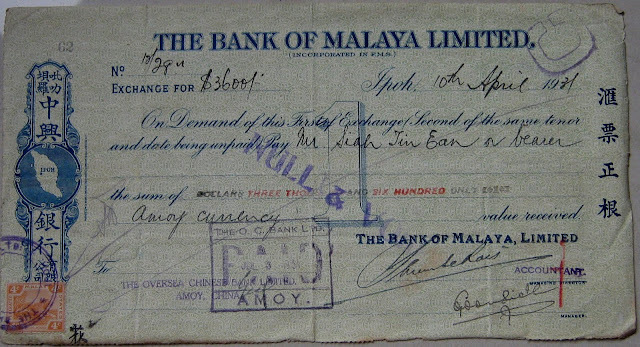 The Bank of Malaya Limited cheque is a very rare piece as the Bank was liquidated during the Great Depression in 1932 and very few is known to exist. The author acquired this piece from a flea market in China. The cheque was issued by the Ipoh branch of the Bank of Malaya Limited and has a 4 cents Straits Settlements stamp affixed to it. It was cashed at The Oversea Chinese Bank Limited, Amoy, China. The Oversea Chinese Bank was the only British Malaya incorporated bank to have a branch in Amoy, China during that time. I am researching the Bank of Malaya. My great great grandfather was one of the board members. Can you share more information, and may I have permission to use your check image in a paper that I am writing? I can be reached at suemenghan@hotmail.com.